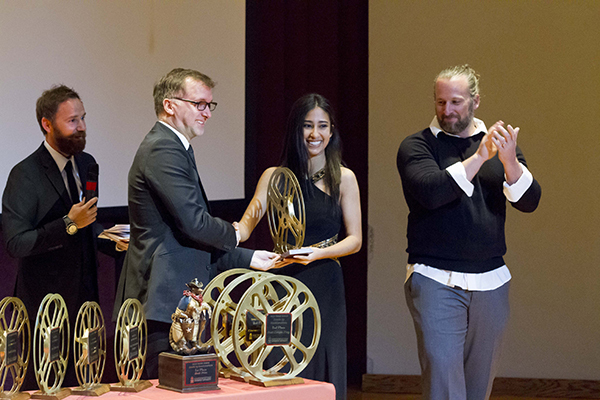 Yari Leal from North Dallas Adventist Academy received the award for best actress, here receiving the award from judge Michael Price, while Kyle Portbury (left) and Chad Gunderson look on. Fourteen academy and high school teams from all over the U.S. recently descended upon the campus of Southwestern Adventist University for “South by Southwestern,” this year’s Brain Games competition. 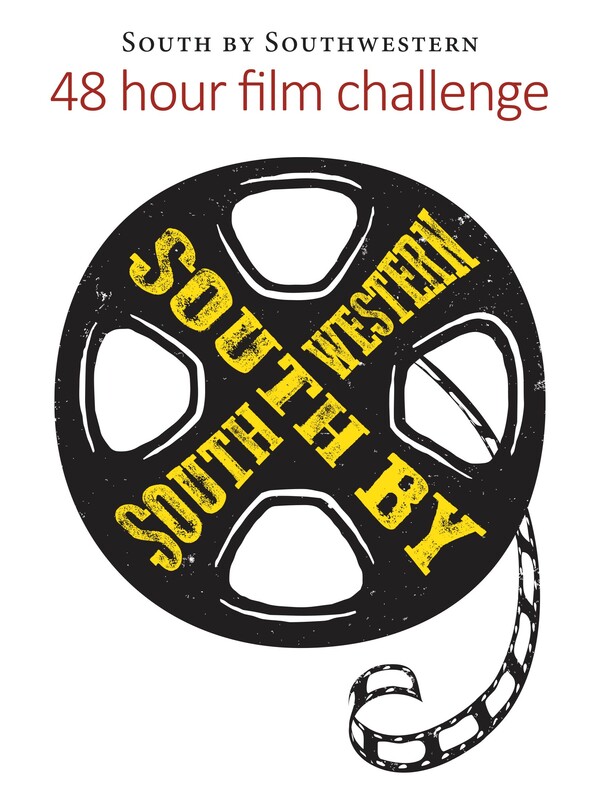 Hosted by Southwestern Adventist University’s department of communication March 30 to April 2, the event challenged high school teams to produce a two- to four-minute short film within a 48-hour window. Rules included filming only on the SWAU campus, using smart phones as cameras, staying faithful to randomly chosen genres and following the overall theme of redemption. And most importantly, an armadillo had to be included in the film somewhere. The event began on the night of Wednesday, March 30, when severe weather and a tornado warning rolled in and welcomed the visitors to Texas. Southwestern communication majors were assigned to act as liaisons to each team, help them locate and obtain things for their shoots, as well as answer any questions about life at Southwestern. Once the sudden storms rolled through, the entire collection of teams made their way to the communication department’s section of campus, all the while witnessing a beautiful double rainbow in the sky. After final instructions, the teams were off. The campus was abuzz with life as the 14 groups went to work on their productions. Participants were not assigned curfews and were allowed to work as long as they needed both nights, and the staff and students from the communication department were available at all hours. Groups were awake long hours as they brainstormed ideas, filmed and edited late into the night. During the next two days, ideas on paper soon turned into shot scenes, and before long the entire process was brought together inside the communication department’s Mac lab where teams struggled with the clock, their footage and each other to complete their projects on time. By 7 p.m. Friday, the 48-hour challenge was concluded, giving teams some rest before the scheduled red carpet premiere event on Saturday night. Nothing was spared to make participants feel special at the black tie event and awards ceremony in Wharton Auditorium on April 2. Professional judges for the event included Kyle Portbury, award-winning Australian filmmaker and new professor at Southwestern, Michael Price, an Emmy award-winning composer for his work on the BBC series Sherlock, and Chad Gunderson, a Dallas-area film producer. After the event, students from all the schools lingered to spend time with the judges and ask questions. Portbury convinced Price to come and serve as judge not only because of their long connection as filmmakers and the opportunity to help students learn the craft, but with the idea of turning his visit into an opportunity for a benefit fund raiser as well. 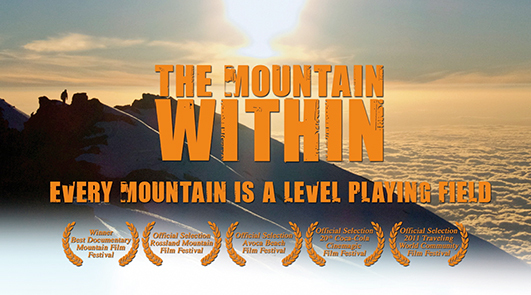 On Sunday, April 3, the two of them appeared at the Fort Worth Museum of Art to show the documentary “The Mountain Within” and raised $2,000 for two local charities: Community Opportunities, Inc of Keene, and Wedgewood Academy of Fort Worth. 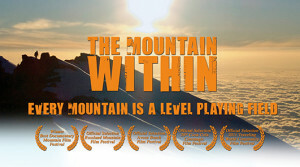 All of the short films were shown at the awards ceremony before the judge’s deliberation began. Criteria being considered included originality, technique, and the most unique way of including an armadillo. Once everything was decided, the winner of Best Film was given to Columbia Adventist Academy for “Identity Crisis,” a tale of a young man trying to become an armadillo before realizing that there is Someone else he should use as a role model. This film also won the award for Best Use of an Armadillo. Second place went to Orangewood Academy for “Runaway” while third place went to Richmond Academy for “The Confession.” Other winners included Yari Leal from North Dallas Adventist Academy for Best Actress, Alvarado High School took out the People’s Choice Award, and Dallas Christian Academy won for Best Directing. The entire event was a resounding success, leading several student participants to ask for it to happen again next year. Glen Robinson, thanks for the link!